I would like to use the msisetup version of filebot but my licensed copy is from MS Store, Can I transfer my license to make the msi version registered? Or do I have to buy a license? 2. I would like to rename and copy my files on my external HD but when I used to it on a previous version Id get subfolders with the file in them. How do I copy them and not get the folder so they are copied into the folder I want, this folder is : (1953)? I have absolutely no idea what you're talking about. Perhaps you want to take a list of file paths from a text file and then pass them into filebot as input file arguments? Please check the SPAM folder if you can't find it. I'm sorry. 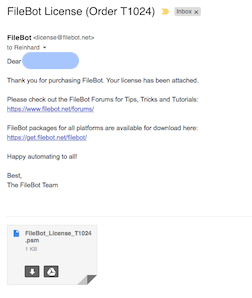 I had focused on the e-mail containing the link to the FileBot folder with installation files and a file called KEYS.TXT. I did not see the other e-mail with the attached .PSM. Now works! Thank you and sorry again! I see. The KEYS file is a GPG public key which can be used to cryptographically verify that each download is digitally signed by me and has not been modified or tampered with. It's not your personal license key. Chacter name is read in from character.txt (a lookup function)and put into in the filename. could you show me code to do this??? Yes, you'll just make sure that your format starts with H:/ and then each destination path will start with H:/ so what you see is what you get. This thread is off-topic for advanced format expressions though. So that's would be a separate thread. Reading text files and doing some sort of look up will require some basic Groovy programming skills though, so not recommended for the average user. I have a new computer and can only find a text license key in my inbox, I do not seem to have a separate email with a psm file. When I copy and paste the license it gives the same error as above. Please could you advise me as to how to get the license to work? Saving the license key to a text file works too. Not sure what could go wrong there. Out of curiosity, please send the license file you created yourself by using copy & paste. I`m having the same issue but I don't know how to PM you.